In mid-December Fianna Fail and Fine Gael agreed a new confidence and supply agreement, maintaining the minority Fine Gael government in place until 2020. The event went almost unnoticed, with smiles from both parties, claims that the agreement was forced by the national interest and the imminence of Brexit. The smaller parties cried foul from the sidelines, having been deprived of an election contest. At a superficial level this can be seen as horse trading between the two major capitalist parties in which Fine Gael got the better of Fianna Fail. Micheál Martin had to walk away without any quid pro quo for supporting the government. In the recent abortion referendum both leaders tried to pivot to take account of the more liberal attitudes within the population. Leo Varadkar succeeded and Fine Gael remain the most popular party. Micheál Martin failed because of the reaction of his own backbenchers stymied his own u-turn and blocked the path back to power for Fianna Fail. He really had no choice but to back down in the stand-off and wait for better times for his own party. Yet what Martin wanted was very little. He wanted some cosmetic public concessions to justify his surrender to Fine Gael, but these were simply to demonstrate a supposed progressive element to Fianna Fail and its ability to gain reforms for its followers. He was trying to disguise the fact that there is only one government program supported in full by both major parties. The lack of concessions makes this crystal clear. We have a government of national unity and the programme of that government is austerity, privatisation, landlordism, the strangling of public services and the crushing of workers’ rights. The continued housing crisis and the handover of a new National Maternity Hospital to the religious orders are recent examples of the programme this government will operate. The ongoing capitalist crisis has been managed by oppression of the working class and it has been successful in ensuring that the workers paid the bankers debt, yet there is a cost to pay in terms of the decay of political structures. Fianna Fail, once the party of government, has been reduced to a shadow. The new national government is strengthened in the short term but weakened in the longer term because there is no longer a serious opposition party with some choice of political programme. The myth of parliamentary democracy is torn away and weakens the illusions of workers in the pro-capitalist parties. But this is bad news for the self-proclaimed left groups also. The Labour Party, themselves decimated by their support for austerity, are trying to claw their way back to the standard position as junior partner in a capitalist government. Sinn Fein are attempting to transition from an old leadership backed by the authority of the IRA towards a more liberal and right wing position. They are out of government in the North and have no prospect of returning. They suffered a setback in the recent presidential elections, and have seen a split to the right around the issue of abortion. The party is skipping and jumping between presenting itself as the main component of a future right wing government coalition and, on the other hand, signalling that it is at heart still a party of the left and willing to protest the right. A delayed election robs them of momentum and allows for greater fragmentation. As for the socialist groups and the independents, they bump along at the bottom of the poll, unable to convince the majority of the population that a programme of parliamentary reformism will be successful. The lack of alternative does not end at the gates of the Dail. The trade unions have been leading lobbying exercises and demonstrations meant to resolve the crises in housing and in health. The formation of what is in reality a national government and the lack of even minimal reform to accommodate the new arrangement between the major parties means that lobbying exercises can have only a very limited effect. The whole reformist effort that has tended to blunt protest across the past decade is now running into the buffers. There are small but significant signs that events are going to slip outside the network of partnerships that link Irish capital and the trade union leadership. So a mass campaign that halted with the withdrawal of the abortion question from the constitution and accepted quite limited legislation has not seen the issue closed down but has seen further discontent around continued links between church and state in the health services. Pleadings at the gates of the Dail around housing were followed by a government plan that will feed vulture capital and landlordism and smoother the path towards a mass giveaway of public land. However protests have not ended and we now have a context of terrorism by paramilitary forces employed by the landlords in evictions and direct action by communities to force them back. The situation today will not stand still. The original confidence and supply arrangement was an attempt by Micheál Martin to avoid the bear trap of coalition. The history of recent times is littered with the corpse of junior partners in reactionary governments that acted as sacrificial anode for the major government party. 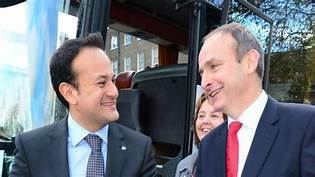 The renewed confidence and supply agreement, his failure to win any concessions in the current negotiations means that Fianna Fail has been reduced to the junior partnership status he was trying to avoid without even the cabinet posts and patronage that are the lifeblood of capitalist parties. The possibility of reviving Fianna Fail must go downhill. There are very large question marks over the ability of Sinn Fein to present itself as the new Fianna Fail and in any case their ambition is for that very target of junior partnership in coalition that has doomed parties in the past. The schemes of the left for a left unity government that would have to be built in conjunction with Sinn Fein have turned to dust. The promise to use the Dail to mobilise on the streets has been turned on its head and is now mobilising on the streets to gain more parliamentary clout. In the absence of any commitment to independent action by the workers there appears to be no realistic strategy for a general mobilisation. As Yeats said in another context: “things fall apart, the centre cannot hold.” The constant grinding of capitalist decay is eroding both the mechanisms of government rule and the standard responses of petition and reform. At the end of the day reformism is based on the belief that the working class will never respond or turn to revolution. We are ready seen preliminary stirrings that will disprove these nostrums. Recently an informal coalition, #wedeservebetter, attempted a mobilisation in the North of Ireland with a single demand that the Stormont administration be returned. Despite attempts to boost the mobilisation by the local press and media, by prominent businessmen and by NICVA, the community and voluntary sector organisers, the mobilisation was a failure, with only a few hundred at various locations and the Belfast rally cancelled. The campaign fragmented when some of the supporters asked to speak about outstanding issues such as abortion rights and gay marriage. They were prevented from speaking. It became clear that the campaign wanted the return of Stormont as an end in itself and were not concerned with the argument that in some way a new administration would make life better. The #wedeservebetter tag could not have been better chosen, summing up middle-class desire for comfort and stability along with disinterest in what it would cost the working-class. However the debate cruelly exposed left supporters of the campaign. Members of the Communist Party and of the Socialist Workers Network/People Before Profit had argued “progressive” demonstrations that took up gay rights and abortion rights could be supported and act as a stepping stone to a more progressive movement. This is not simply mistaken, it is misdirection. The left are fully aware that sections of the DUP are perfectly willing to split their party to prevent any social reform. Without an inbuilt majority the DUP would not reverse direction to support a return to Stormont. In pursuing this line the left are simply accommodating a narrow section of middle-class youth. They are also accommodating the trade union bureaucracy, who argue that Stormont will have to return in order to legislate for workers’ rights. This is despite the fact Stormont has no history of any progressive actions and ignores the fact that the bureaucracy, in order to save Stormont, accepted the “Fresh Start” austerity programme and have signed off on health and community services reform which will mean widespread privatisation. There is widespread public anger at the lack of an administration which is a denial of democracy false). The North of Ireland has none of the characteristics of a nation. The local administration is not a government. It has collapsed not because the parties couldn’t agree but for the reason that the DUP withdrew from the agreement because it included minor concessions on the Irish language. The absence of Stormont is perfectly in tune with the results of the last election, where nationalist voters opposed any further capitulation to the DUP and Unionist voters voted to “defend the union” even if this meant opposing devolution. Rather than public anger, there is widespread public indifference. People are very aware of the corruption and sectarianism that infested Stormont and do not see its return is helping them in any way. Perhaps the biggest lie is that the North has been without a government. The fact is that it has been continuously governed by the British Westminster administration before and after the collapse of the local administration at Stormont. No one on the left or right is willing to acknowledge this. There are committed to a programme of reform through a local administration even though their experience is of endless corruption without the slightest sign of reform. It follows right away that the target for campaigns to demand democratic rights should be the Westminster government. At the moment British rule is based on a fiction, held up by the compliance of other parties that is outside all the legal frameworks established by the Good Friday Agreement. Under this agreement the failure to convene an administration should mean the abolition of the body and the institution of direct rule. As it is, the British have instituted invisible direct rule, where they have absolute responsibility for the administration of the six counties but refused to acknowledge this. This enables them to support the DUP, who have demanded direct rule, to park the whole issue of the collapse of the Good Friday Agreement, and to avoid any serious consultation with Dublin, who are formally required to be involved but in any case did not want to be consulted. Sinn Fein remain silent because they intend at some stage to return to the Assembly and because they cannot afford to admit that decades of strategy have ended in failure. There is one other string to the British bow. They have a strategy of Old King Log (from Aesop’s Fables – The Frogs Who Desired a King). They do only what is necessary but freeze many funding streams in order to starve local groups of money and patronage. 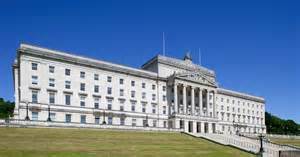 This story is that if Stormont reassembles many of the problems of health, education, welfare and social services will be resolved. This is a complete fantasy. When it was running Stormont was a source of endless corruption and sectarian division. Before it fell Sinn Fein and the DUP had agreed a full spectrum of offensives that would see the quality of public services and the standard of living of the poor fall dramatically. It is however an argument enthusiastically supported by the trade union bureaucracy and by the NGOs of the community and voluntary sector who are directly dependent on government patronage. Despite the claims of the #wedeservebetter campaign neither community has changed its position. For Unionists rejection of the Good Friday Agreement and defence of the union is all. For nationalists some concessions from the DUP are regarded as necessary for further progress. Rather than demanding the return of Stormont the prevailing mood is one of apathetic indifference. So why does there #wedeservebetter continue to have a hold? It has broad sympathy. There was widespread media support for what turned out to be an imaginary mobilisation based on a Facebook rant. Alongside the campaign came support from Belfast’s leading luxury hotelier. In the van was NIVCA, representing a range of charities and NGOs poised to assist in the privatisation of many public services in the name of community and anxiously waiting allocation of funds from Stormont. There was some representation of public sector workers at the Derry demonstration and this represents constant reassurance by the trade union leadership that the collapse of local services and of workers conditions will be repaired when Stormont resumes. In typical cowardly fashion the union leaderships went into hiding at the first sign of controversy. Above all the source of the #wedeservebetter sentiment lies with Sinn Fein itself who, while they refuse to surrender immediately to the DUP, have made it absolutely clear that they are committed to the return of Stormont and that is what everybody else should be supporting. There is an alternative, spelt out by Bernadette McAliskey, as #bulldozestormont. As explained above this has had little traction because the vast majority of the political forces outside unionism are committed to the return of Stormont and even within the DUP there is a strategic debate about which road will best maintain their position – direct rule or a return to devolution. The other issue is that #bulldozestormont can only be implemented as part of a drive for United Ireland. The capitalist parties in Ireland are in fact going in the opposite direction and flirting with a return to the Commonwealth. As Brexit looms a United Ireland inside Europe is the best option for Irish workers in the absence of an international workers movement able to overthrow European capital. In the absence of the independent action of the workers all sorts of fantasies such as #wedeservebetter will gain currency only to be exposed as illusions.